Our favorite blond-haired high heel wearing Smurf is here to save the day and in style too. Smurfette's Magic Match from Flashman Games LLC takes you on a puzzle-solving journey through Smurf village and 160 levels of gem matching fun. Then, use your coins to unlock different outfits for our blue heroine. A mysterious power has descended upon the happy Smurf village, stealing the memories of all our blue friends save for innocent Smurfette. Help sweet, little Smurfette uncover the mystery that looms over Smurf village as you traverse 160 smurftacular puzzle filled levels, mix, match and swap smurfy objects that sparkle, unleash magical potions to blast away rubble that stands in the way, earn coins to dress up Smurfette in sweet new clothes and accessories. Hey, a girl can look good, while she's saving the day. SWEET SMURFETTE - Help Smurfette uncover the source of the puzzling mystery that has stolen the Smurfs' memories and save the village! GEM FILLED PUZZLES - Mix, match, and swap smurfy objects that sparkle to match three or more at a time to clear those objects and complete levels. BLAST AWAY - Line up four or more Smurfy objects in a row to unlock and unleash powerups and magic. CHALLENGING LEVELS - Make your way through 160 Smurftacular levels. GIRL POWER - Use powerful boosters featuring your favorite friendly Smurfs like: Greedy, Brainy, Jokey and more to breeze through levels. SMURF STYLE - Make a heroine look fashionable as she saves the day by earning coins and buying new clothes to dress up Smurfette. Who says a girl can't sparkle while saving the day? 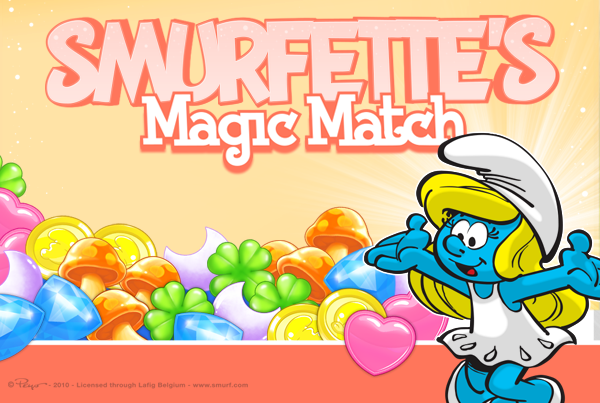 While I'm really happy the classic Smurfs have a noticeable presence in the mobile gaming world with Smurfs Epic Run and Smurfs Village, I didn't really connect with Smurfette's Magic Match. I enjoy and have played some of the popular 3-match games but the graphics unfortunately don't "match" the big boys. The special potion moves were a little confusing at first even though I managed to get through the long tutorial. And being the typical male, buying new outfits for Smurfette is not really my thing. Bottom line is as much as I like seeing the classic characters this really didn't hold my interest. If you are into popular online and mobile games like the Major Millions slot game, endless runners, or the latest bird-throwing sequel, Smurfette's Magic Match is probably not for you. If you a female and an '80s kid who remembers watching the Smurfs on Saturday Morning, then give it a try. The game does hold an above 4-star rating in Google Play and iTunes. Smurfette's Magic Match is free to play, but charges real money for additional in-app content. You will be able to lock out the ability to purchase in-app content by adjusting your device’s settings. Download now for free in the iTunes, Google Play, and Amazon app stores.